In this challenging regulatory environment, Commercial Banks are finding themselves under ever increasing scrutiny when it comes to managing their commercial loan portfolios. 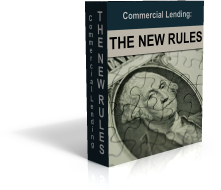 Whether they are underwriting new loans, reviewing existing loans, verifying their loans have been properly documented based on the approvals in place, managing their loan loss reserves and problem loans, or just making general management decisions for their entire loan portfolio, there is much to be done. Unfortunately most institutions cannot afford to hire all of the staff necessary to meet all of the increased regulatory demands combined with the best management practices to ensure a good portfolio and to minimize potential loan losses. This is where the benefits of a good outside loan management and loan review partner can come in handy. When there are demands for existing lending staff that they lack the time, expertise, or are required by regulations to have a third party review, out-sourcing those needs to a well-trained bank consulting firm can prove essential. Out-Sourced Underwriting – we underwrite loans on an out-sourced basis so you don’t have to. Loan Review / Audit Services – we have an extensive team trained in all aspects of loan review that are capable of doing extensive portfolio review to assist existing institutions in better managing their portfolios or to help institutions make decisions about acquiring new portfolios. Alternative Borrower Funding – through our Borrower Services Division we provide a dedicated team of lending professionals with connections to over 200 lenders nationwide to help find financing for lender denials or to help move loan relationships a Bank no longer wants to participate in. Participation Assistance – through our extensive network of existing lending relationships we can help institutions find participation partners for loan requests that exceed their legal lending limit or just large relationships that they want to spread the risk on. Equity / Capital Assistance – we work with a number of financial partners with equity and capital looking to acquire institutions, invest in financial institutions, or purchase commercial loan portfolios. We work with our banking clients to help them find capital and equity solutions to best manage their balance sheets. Our team of dedicated professionals has the experience to assist our clients with all of the above services. Although there are other competing institutions in the market, including many accounting firms that provide similar services, what sets us apart is our approach and our experience. Having all served as traditional commercial lenders, credit managers, and credit underwriters, our staff’s experience is second to none when it comes to underwriting and reviewing loans. Unlike having junior level accountants doing the audit work with no experience in lending, our backgrounds allow us to identify trends, risks, and potential problems in loan portfolios that others might not see. Most of our staff has experienced similar such problems in their careers, and know the warning signs and how to address them. In addition, all of our staff has experience working with regulators and understands the demanding regulatory environment, and can help guide our clients to achieve improved processes, limiting regulator scrutiny. We would love the opportunity to show you what we can do. Whether you want to see examples of past work or testimonials on work we have completed, we will do whatever is necessary to give you the confidence to trust us with your business. We are insured and ready to serve you.